Do you ever get lost practicing the saxophone, despite having played for several years? Playing music involves a ton of elements – rhythm, notes articulation, dynamics, phrasing, and much more. It’s easy to focus on one thing and get that right but find that you lose track of other parts! That can be frustrating to say the least. Getting thrown off when playing makes the music fall apart. And if you’re getting frustrated, it can discourage you because you feel like you are far away from sounding like you want. Almost makes the practicing you have done feel like it doesn’t matter because the mistakes stand out and you focus on them. Have you gone through the motions of practicing the saxophone but seen little progress? You have probably heard about things you should practice- scales, rhythm, tone, etc. So you work on some of these things and try to learn some songs you like. But it doesn’t quite all come together. You don’t know if what you’re practicing is what will really help you. And you’re playing the music, but something is missing…..
You keep practicing and some things improve, however, other elements do not. If you keep practicing like that, you will end up practicing bad habits and make those habits stronger and difficult to overcome. Learning to play saxophone on your own means different challenges than learning with a group in school. With the group, there are other saxophone players who often can help you with things and answer your questions. Some of them may be a little ahead of you, others a little behind. That can help a lot! This may be the experience you had some years back. If you did play many years ago, you’ll have to relearn quite a few things! The tone you developed before will have to be rebuilt. You probably learned scales and songs at some point, but it’s really easy to forget things if you don’t practice them. It can seem like there are so many things to work on. But you just want to play and have fun…..
You want to be able to jam with other musicians. That’s what it’s about! Getting in the flow of the music. Adding something to the band and enjoying yourself while sharing the music with others. However, there are often obstacles. You probably hear things in your playing that you want to fix, maybe a certain note seems a little flat or you can’t quite seem to play a part of the music in time. But recognizing the problem is not the same as knowing how to fix it. It may seem like you play the same ideas over and over again in your solo and your want to sound more fresh and interesting. If you check out discussions online, they may focus on saxophone models and altissimo…. Do people ask you to play your saxophone? What happens? If you have started playing sax, you may hear people saying ‘ oh a sax! Play us a tune!’, but it may feel like you can barely do if you have just started….. It would be fun to play for them if you felt comfortable. Do you want to improvise or play by ear? At first,you probably want to get to the stage where you don’t have to stop for a second and think about which sharps or flats to play…. Just be able to play them naturally! Now imagine knowing songs, being able to connect with the rest of the band, and nailing your solo. Knowing how to practice allows you to relax more as you play and make the music sound more like it should.It can feel like a struggle to, for example, learn music by ear at first, but if you approach it systematically and start simply you’ll find it’s easier than you imagined. You may try to do at least half an hour each day but without a “routine” – just doing scales and then playing around a bit.Music connects many elements. It can help a lot to understand the different parts of music, “wavelengths” if you will. Developing a better practice routine based upon focus and structure can make you sound much better more directly. The persistent problems that seem tough to fix might be something that you can change easily if you know certain things. Tricky transitions, trouble with low notes, etc. Avoiding frustration can make learning the saxophone much more fun. Learn with me and we’ll fix those persistent problems. 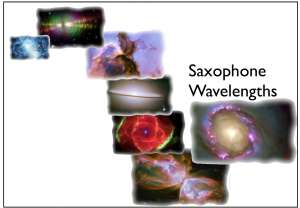 Saxophone wavelengths is a system to understand how all of the pieces fit together. You’ll learn about when to isolate the wavelengths and how to bring them all together to play music. You’ll see inside the music and how focusing on one thing can make the rest of the music sound much better. Understanding how to play music can let you make a beat up old sax sound good. The most expensive instrument will not make a beginning player sound like a professional though. Understanding how all the parts of music work together and working on theme individually when necessary makes you sound good. Saxophone Wavelengths shows you a step-by-step method with checklists and specific exercises to work on. You could check websites and find various free lessons, but it’s sometimes difficult to know if the person giving the lesson knows what they’re talking about. And they’re not organized in a system. A clear set of guidelines and a systematic approach can improve your results. How do you know if your practice on the saxophone is effective? How can you know if you’re understanding all the elements of the music? With Saxophone Wavelengths, you’ll make consistent progress. Reason 1: Saxophone Wavelengths is a systematic approach. Reason 2: It’s not a ‘trick’ that will make you a professional in a day. Those don’t exist. Reason 3: You can find things that you want to fix in your playing and sound better. 1.2 Reeds – they only grow in a few places and are aged for 10 years, the most important piece of equipment when playing, a few things I have learned about them. 1.3 Mouthpiece – second most important piece of equipment, works in combination with the reed, understanding the array of numbers and what really matters. 1.4 Checking for common issues that can disrupt your playing. , the most important thing! What we listen for as we learn music. 2.4 Expanding who you listen to, suggestions on music you might like. 3.1 Fingers – huge piece of technique that is often not a focal point. Details on a very effective set of exercises to develop technique. 3.2 Airstream – being able to hold a steady airstream gives you power in your sound. 3.4 Articulation techniques – making your playing smooth and giving it kick. 4.1 Basic rhythms – One of the most important pieces of the music, notation and mathematical relationships of durations explained simply. 4.2 Articulation – rhythm on a finer scale, how it makes a huge difference in the feeling of the music. 4.3 Phrasing – phrasing matters when you speak and when you play saxophone. 5.1. Personality – overview of tone and what it can do as you play. 5.2 Three types of tone and how to use them. 5.3 Implementation – Developing a rich and big tone with versatility. 6.2 Piano – how playing piano helps you play the saxophone better. 7.1 Structural constraints – New ‘flavors’ of sound- diminished scales, overtones, etc. 7.2 Inspiration from listening – ideas on what to check out. 7.3 Drawing from new experiences and bringing them into your music. 1. Many saxophone players are focused on the mouthpiece, reed, and horn. Musically, they focus on a narrow range of what is possible. 3. There is zero risk. 100% guaranteed for 30 days. Take your time to check it out and try out the approach. If it doesn’t seem to work for you, just email and you’ll get your money back. Compatibility: Will the class work on both Mac and PCs? Yes, you can make a payment using your credit card on Paypal without a Paypal account. You can also send a check upon request. Guarantee: Yes, there is a 30 day guarantee. Support: If you have an issue or question you can email me and I’ll do my best to help you. Bonus 3 (premium only): Get feedback on any song that you are currently playing, send me a recording and I’ll check it out and give you some suggestions. Eligibility:You will have to agree to practice the material and work on the challenges.If you do that, you’ll learn a lot and be glad you signed up. Course with 7 Wavelengths of Playing Saxophone. Duration of three months. If you do not yet have a Paypal account, first select, ‘no Paypal account’ then there’s a scrolling menu for country where you should select your country. After that, the languages may switch to your language.